Total Excel Converter is the right choice to convert XLS, XLSX, XLSM, XLT, XLTX, ODS spreadsheets to PDF, Open Office, Word, Text, CSV or Lotus files. 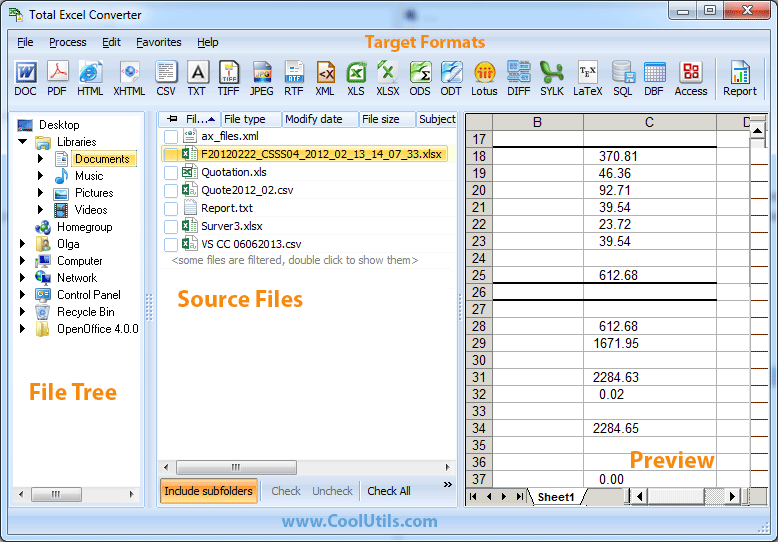 Excel Converter has the widest list of supported formats. It includes OpenOffice ODT and ODS, Word (both Doc and DocX), PDF, HTML, Access, TXT, Lotus, ODT, ODS, XML, SQL, WK2, DBF, TEX, DIF, SLK, SQL, LaTeX, DIFF, SYLK. DBF tables are also supported. The latest version can convert WAB address book as well. Total Excel Converter is very powerful and has lots of additional options. For example, converting XLS to PDF users can encrypt the final PDF document and combine several spread sheets into one multi-page file. You can also choosea particular sheet to be converted. Total Excel Converter converts files via user interface, from the desktop or can be used via command line. Processing thousands of files the program always keeps your folder structure in perfect order. Get the professional Excel converter with GUI and command line now.